Have you liked a property in a new place to move in with your husband after marriage? Before you take that property on rent, you and your landlord must sign the agreement papers and also settle and get the security deposit refund agreement ready with that. How will you do that? Well, our collection of templates consists of several Deposit Forms. 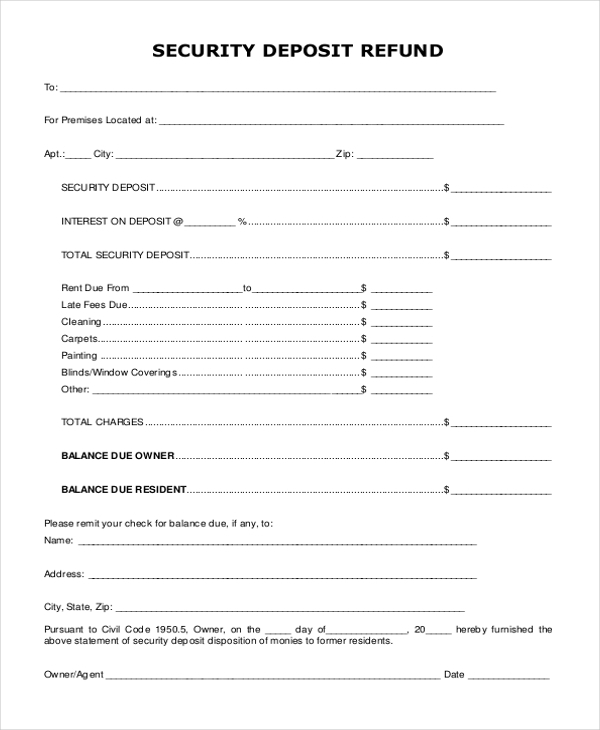 As a landlord, if you are letting your property on rent, this tenant security deposit refund form template can be required by you. Download it, customize, print and use for keeping it as an agreement. When you are looking for tenants for the apartment you want to let, you will need to get a security deposit refund form for making an agreement with your tenant. Just download, take print out and use. 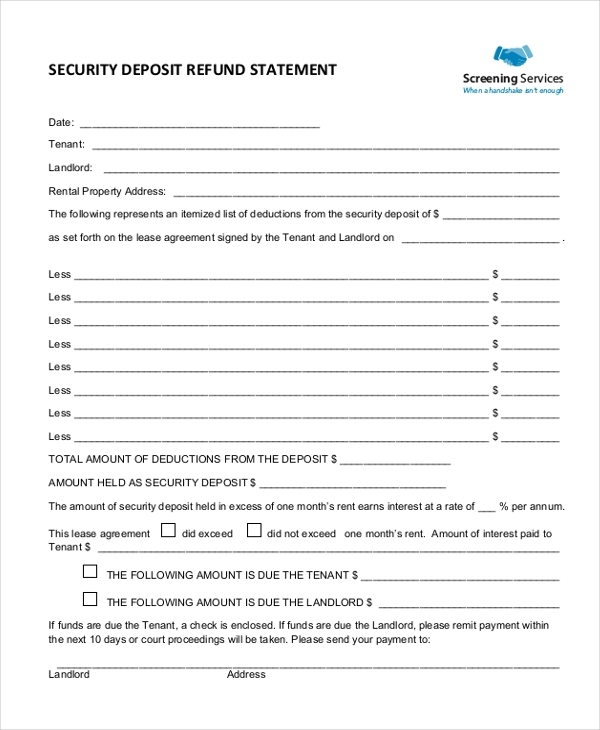 Being a landlord, this receipt of the security deposit refund form template will be extremely necessary for creating an agreement with your tenants. Just customize, print and use it accordingly. 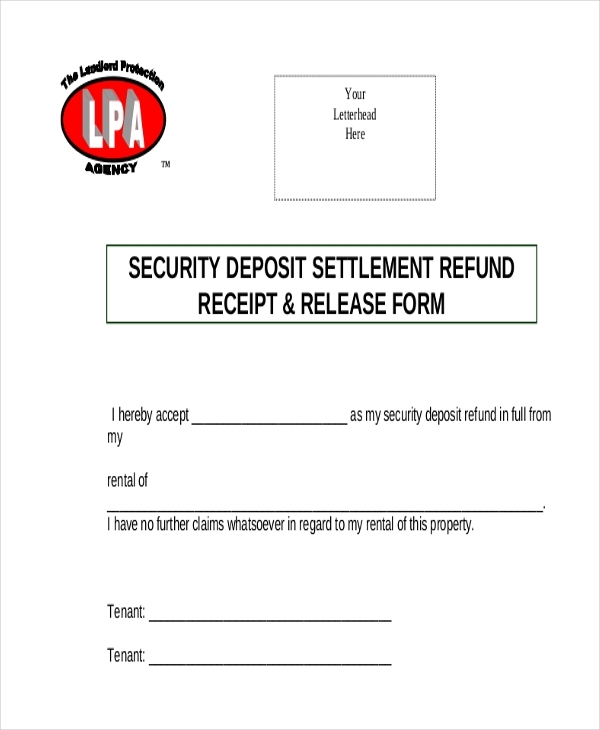 This security deposit agreement refund form template will pose as an agreement with your tenant if you are letting go of one of the places you own. Just download, print and use it. If you have taken a security deposit from your tenant, and want to create an agreement with them regarding refunding the amount at regular intervals, then this security deposit refund statement template is a must download. Print and use. As a landlord, while taking a security deposit from your tenants, you must make an agreement regarding the refund of that amount. 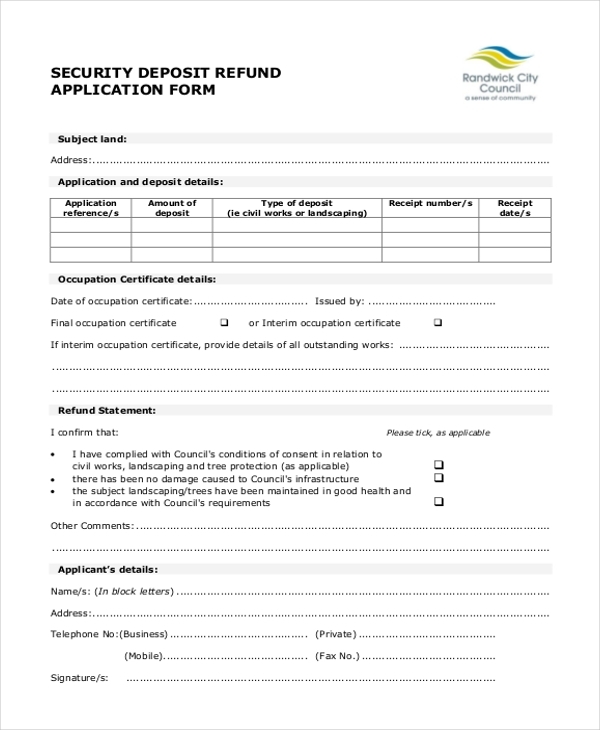 This security deposit refund application form template should be downloaded by you for use. If you are taking security deposits for the college hostel from students, creating and filling up a security deposit refund/transfer form is a must. Download this template, customize it and use it accordingly. While creating a lease agreement with your tenant as a landlord, you must create a lease security deposit refund form agreement. For that you can definitely download this template, customize it and use. A sum of money is always kept as a security deposit when a tenant rents a property or takes a lease from the owner or the landlord. It is somewhat mandatory due to security reasons. While making the agreement of rent, there are various clauses, which gets mentioned regarding refunding of the security deposit amount. These security deposit receipt form templates are very much necessary for explaining and agreeing jointly by both the parties. All the points are mentioned in these templates and they are available in various formats. Even any novice person can easily download these templates, customize it and then print it for their use. You may also see Payroll Direct Deposit Forms. Any business property owner, hostel owners or any tenant who wants to rent those properties, want to become paying guests or want to take a lease of any particular place can download these security deposit templates. These deposit agreement form templates are available in PDF format. The collection of this kind of templates has many varieties. Based on your requirement you can download them into your system. You can completely edit the content, replace it if required and then get it printed for your use. 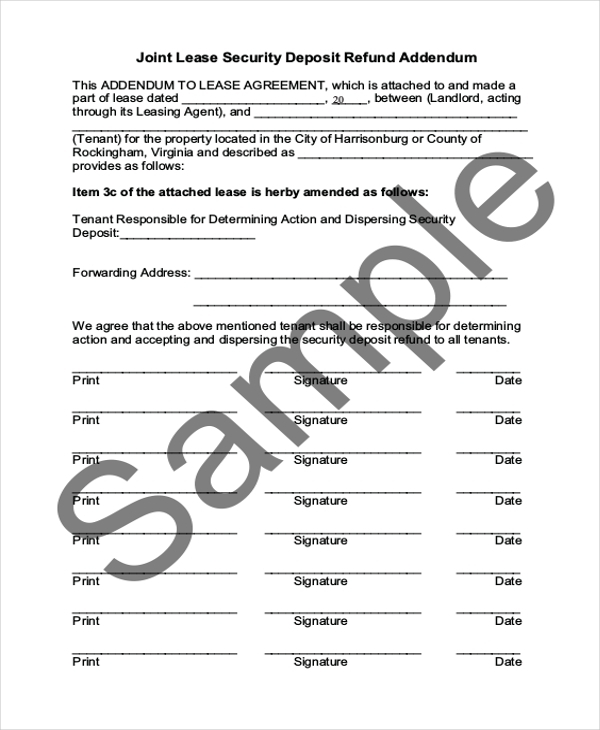 Then this form can be used by the landlords or the tenants for creating an agreement with agreed points and clauses. 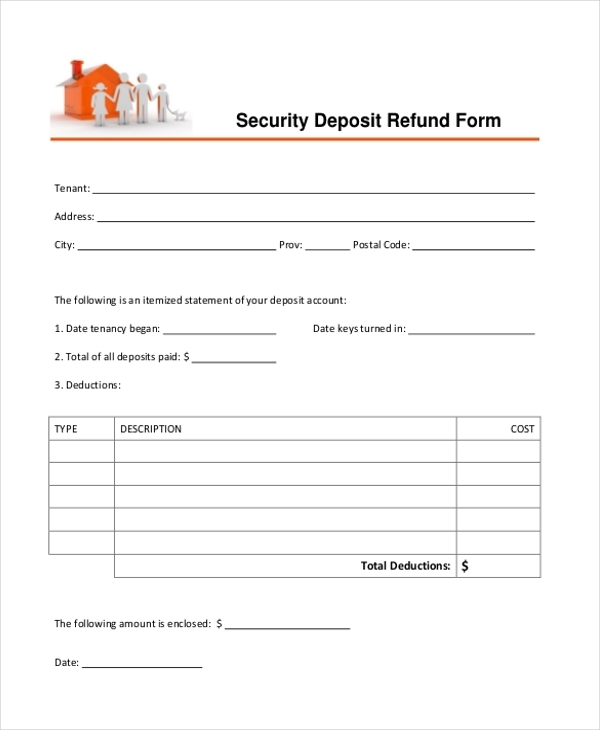 There are several benefits you can avail with these security deposits refund form templates. As a landlord, while taking security deposit money for a property you are letting out on a rental basis, you must create an agreement regarding refunding that money to the tenants. There can be several causes like refunding it while the agreement expires or refunding it on a monthly basis. For these refunding procedure, one must create a security deposit refund form which is to be signed by both landlord and the tenant after agreeing to the terms and conditions. 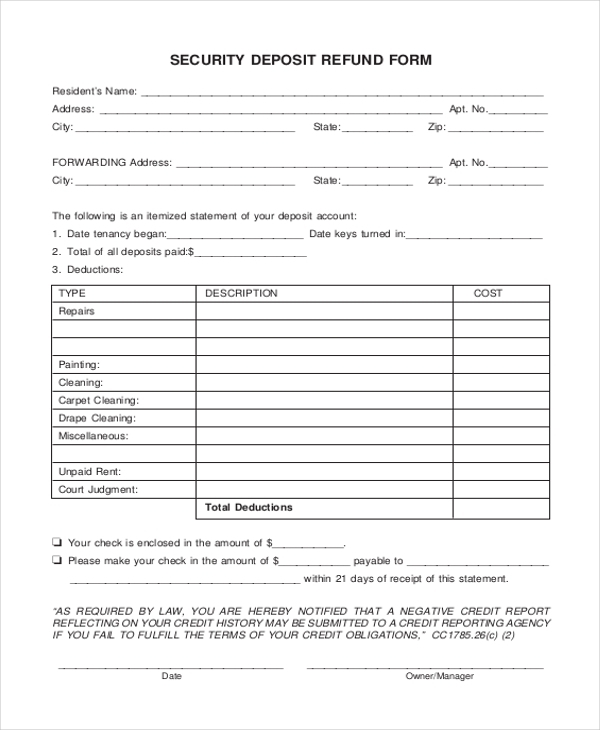 For this form creation, you can download these security deposits refund form templates. You can also see Security Deposit Receipt Forms. 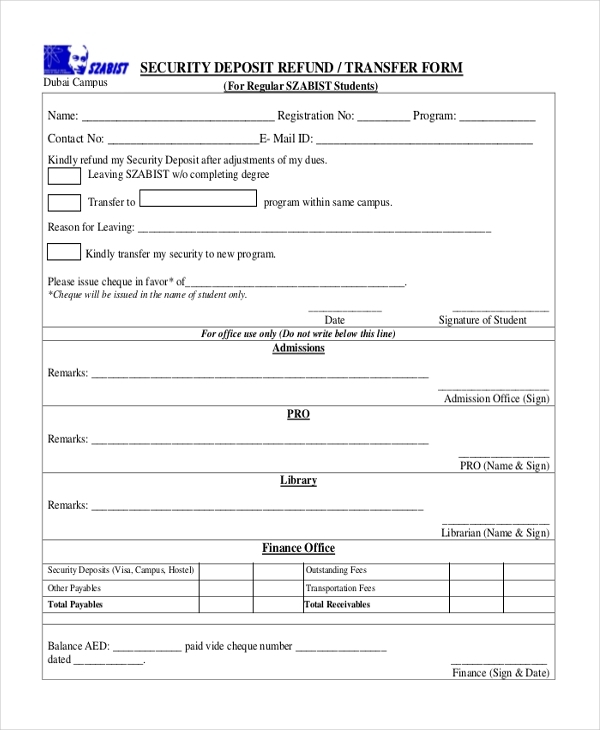 Browse through our collection of various security deposit refund form templates available in Internal link anchor text format. The collection of these templates can be downloaded by both landlords and tenants. They are available in many varieties. Based on your requirement you can then download, customize and print them for use.